This post is sponsored by Andy Boy | Thank you for supporting the brands that I love + trust! Honestly, May was a whirlwind. But we’re finally back into our routine after some much welcomed family time and it feels good. It was nice to dine out night after night and show our fam the delicious and exciting eats that our beloved city, Raleigh, has to offer. But after a while all I want is home cooking; I crave cutting my own vegetables, blending my own flavors, and plopping onto the couch to enjoy them. And then there’s that euphoric feeling of grilling at home on the deck. Nothing makes me happier than standing out on a deck and grilling in the glow of the late afternoon. It’s euphoric. Add to that a nice al fresco dinner with wine and good company, and I’m in my truest happy place. 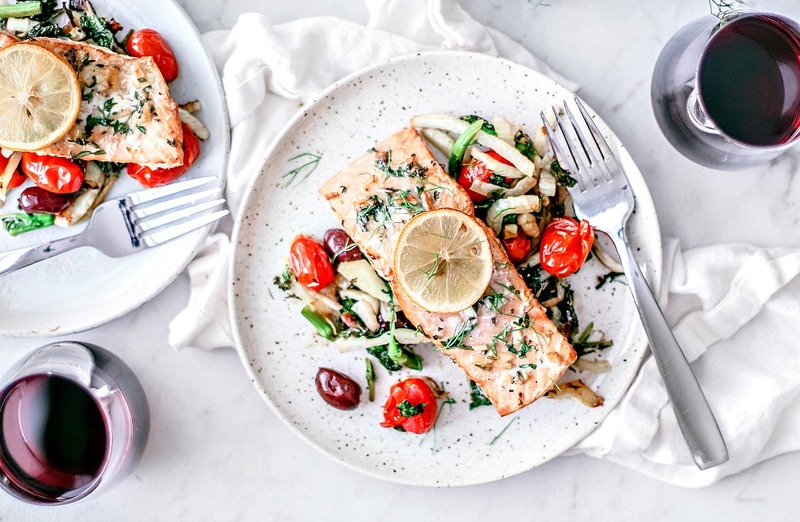 In my mind, this cedar plank salmon, rubbed with herbs and garlic, served over roasted fennel and broccoli rabe salad screams for that exact scenario. Cedar Plank Salmon With Fennel and Broccoli Rabe Salad. When I hear “herb and garlic”, my mind goes straight to artificially flavored things—like cream cheeses, crackers, flavoring powders, dry rubs, etc. But in this recipe, herbs and garlic are used in their purest and punchiest forms. I’m talking fresh garlic muddled with fresh basil, rosemary, and thyme snipped straight from the garden. And then there’s the whole fennel and broccoli rabe situation, which is straight up fabulous in the most simple and approachable way. I’ve known about this ingredient for years from watching cooking shows and thumbing through frilly cookbooks, but I hadn’t used it myself until very recently. I think the common comparison to “black licorice” threw me off. Not because I dislike the flavor, but I had a hard time envisioning it in a dish. Eventually I just bit the bullet and snagged one from the produce section at my local grocer; it was staring at me and, working as a food blogger, I felt as if I should get to know this dang plant once and for all. How could I have worked with things like jackfruit, sea beans, and romanesco, but never fennel? So here’s the deal: fennel is fabulous. The hint of black licorice is just that—a hint. It’s more faint than anise; it’s refreshing, crisp, and it pairs wonderfully with citrus fruits and briny mediterranean flavors, like kalamata olives. One of my favorite things about fennel is that it’s a heart-healthy veg with strong anti-inflammatory nutrients like folate and vitamin C. It also protects against bone loss with vitamin K, it improves digestion with it high levels of fiber, and it’s an immune system booster. Toss it with some nutrient-dense broccoli rabe, serve it with some flaky omega-3-rich salmon, and you’ve got a powerhouse. See a detailed how-to on how to grill fish on a cedar plank here. You can subscribe to my newsletter here! This cedar plank salmon is garlicky, herbaceous, and subtly smokey. Serve it over a bed of roasted fennel and broccoli rabe salad for summer dinner perfection. 1 cedar plank, soaked for 1-2 hours prior to use. Roasted Fennel and Broccoli Rabe Salad. 2 fennel bulbs, sliced into 1/4-inch slices You don't have to be exact with the measurement of fennel slices, but you don't want to shave the fennel since we're roasting it. 1 lemon, cut into 4 wedges. Soak your cedar plank for 1-2 hours before use. (You can soak it in plain water or kick things up a notch by soaking it in wine or cider!) Once the plank is ready, remove it from the liquid, dry it off, and set it aside. Preheat your oven to 450° F and your grill to medium heat, about 350° F.
In the meantime, in a small bowl, mix together the minced garlic, basil, thyme, rosemary, olive oil, salt, and pepper. Evenly spoon this mixture over the salmon fillets and, with clean hands, gently press the rub into the fillets; set aside. Place the fennel, tomatoes, olives, and broccoli rabe into a large bowl. Drizzle with olive oil and season with salt and pepper. Toss the salad with your (clean!) bare hands, gently massaging the oil into the broccoli rabe leaves. (The florets don't need to be massaged.) You can add a bit more oil if needed. Once the salad is well tossed, spread it out over a baking sheet and roast for about 15 minutes, or until the tomatoes burst and the fennel is tender. Stir halfway through cooking time. With grilling gloves or hefty oven mitts, carefully remove the plank from the grill. Plate your fennel and broccoli rabe salad, place fillets on top, sprinkle with fennel fronds, and serve; squeeze fresh lemon juice over your plate before digging in for an extra punch of bright and fresh flavors. This is just such a gorgeous dinner. I've been drooling over it on social since you posted it. I am such a fennel fan, and it pairs so especially well with seafood. This salad must be the perfect contrast to that buttery, flaky cedar-planked salmon fillet. I think this will be on the menu for my next summer dinner party! That is some gorgeous fennel! I think fennel is on of the pretties veggies out there- I love those green fronds. And with cedar plank salmon?! omg- YUM!!! I need this in my life! I was the same way with fennel. I'd always look at it and kind of smile at the idea, but keep walking. Not anymore, though! It's just too good. All of these flavors are the perfect pairing. This is the ultimate summer fish dish that I can't get tired of. I had never cooked with fennel before, but its a flavor I love. This is a family favorite. I'm glad you you dove in to fennel, it's an amazing veggie and nothing else is quite like it. I have never heard of jackfruit though, how do you use it? What is it most like? This sounds interesting, I'm going to have to try it. Your salmon looks amazing btw! Absolutely gorgeous, everything is cooked to perfection! Broccoli rabe is one of my favorite vegetables and this salad looks amazing and so tasty. Thanks for the inspiration! Salmon and fennel is such a classic and fabulous pairing. This recipe is just fabulous. I love all the herbs and garlic. They add so much flavor to the fish. I love grilling salmon on cedar planks. It always produces perfectly delicious fish. OMG...we love grilling salmon on cedar planks. Always turns out so delicious and moist. Love the flavour profile happening here. With the HOT HOT HOT long weekend approaching, this just might have to be dinner one night. This is so fresh and appealing! And, yes, fennel needs more love. I don't really think it tastes like black licorice. This dish reminds me how much I love fennel. I like it raw, but also slow braised. This bright salad looks delicious -- and salmon is such a treat -- especially at this time of year when you can get the wild salmon from Alaska. I was just up in Raleigh this weekend with a girlfriend and we had a great time visiting the Farmer's Market and brunching at Poole's diner. Can't wait to go back for another visit! Hahaha, Dawn! I think that's happened to all of us at some point. I hope you were able to salvage your dinner, but nothing is more of a buzzkill than when something bursts into flames. My husband started a fire in our kitchen last year. Then he panicked and started fanning it and blowing on it. I was like, really dude? Baking soda. Pass me the goddayum baking soda. This is such an interesting recipe. I like how flavorful the salmon recipe is and how you paired it with the veggies. Definitely a keeper. I'm a big fan of fennel and love how it changes as it is roasted. The salad sounds like a great accompaniment to the salmon and it all looks so delicious! Wow, this looks and sounds so amazing! I love Salmon, so I definitely have to make this! This is full of some of the most fantastic flavors... and some of my favorite vegetables!! I've never paired broccoli rabe and febbel bulb together... I cannot wait to try this!